Born in Moscow on August 19, 1957. Honorary member of the Russian Academy of Fine Arts. Vice-President of International Academy of Creative Endeavors. Member of Union of Artists of Russia, International Arts Fund, Russian Artists’ Creative Union, ’ Association of Russian Artists in Paris. medals of the International Academy of Creative Endeavors and other public organizations. More than 50 major high-profile solo exhibitions both in Russia and abroad may be rightfully considered the artist’s commendable contribution to the Russian culture. Experts recognise a high professional level of the artist’s creative works. and other art galleries and state exhibition halls of Moscow. Victor E. Lukianov extensively promotes contemporary Russian art abroad. Elena Yakunina, «Engine for Creation»/ La Pensee Russe. Paris, 10-16, November 2005, № 42 (4575) and others). 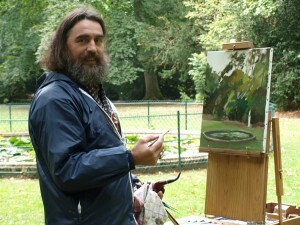 Victor E. Loukianov is the laureate and prize-winner of Russian and international art competitions. Award-winner of X Moscow Contemporary Art Exhibition and Competition «Golden Brush – 2000». Laureate of the Annual XI Moscow Contemporary Art Exhibition and Competition «Golden Brush – 2001» in the category «For Spirituality in Fine Art». Prize-winner of the Annual XII Moscow Contemporary Art Exhibition and Competition «Golden Brush – 2002». Was awarded Grand-Prix of the Annual XIII Moscow Contemporary Art Exhibition and Competition «Golden Brush –2003». XXVI Painting competition (Competicion de pintura rapida) «CUIDAD DE LEON» in the City of Leon, organised by Academia de Bellas Artes «Santos» (Was awarded by the Santos Fine Arts Academy).